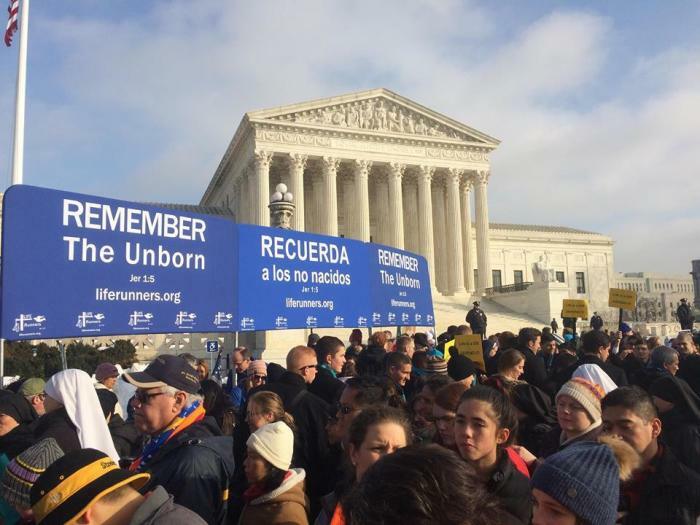 WASHINGTON — The decadeslong cause to defend the unborn is nearing the "tipping point" in society and in government, longtime pro-life leaders and legislators say. "For the first time in my adult life I can see the light at the end of the tunnel on the issue of life," said Penny Nance, president of Concerned Women for America, in a Friday interview with The Christian Post on the National Mall behind the March for Life stage before the noon rally. "And I feel more passionate and optimistic than I have about the cause in years," she said, mentioning President Trump's judicial appointments, including two Supreme Court justices. Her organization is going to "stomp on the gas" to get the dozens of pending nominees through in the next two years, she explained, "and God willing another four with this president." "And we don't wish any ill; in fact, we're praying for the health of [Supreme Court] Justice Ruth Bader Ginsburg. But regardless of what happens, there might be a retirement and we're ready." "We've had two Supreme Court justices confirmed with the most hostile conditions possible; the left has thrown everything at us that they possibly could. And make no mistake, the controversy around [Justice] Brett Kavanaugh was about one woman, and her name is Jane Roe," she said, referring to the plaintiff in Roe v. Wade, the 1973 landmark case legalizing abortion nationwide. Nance stressed: "And we will be ready to do the same with the next justice, whoever that is and whenever that is." Marjorie Dannenfelser, president of the Susan B. Anthony List, a pro-life political action committee that works to elect pro-life women to Congress, shares Nance's optimism, particularly in light of the current data. "We're just about at the tip of the tipping point," she told CP Friday. "Some of the recent polling coming out is even surprising to me," she said, encouraged by Marist surveys showing self-described pro-choice people saying abortion should be restricted to the first trimester. "I don't take anything for granted, ever. But we're in a really good place and we need to keep going," she said. "It's not a conservative or liberal issue for millennials, it's a justice issue for them. It transcends the political boundaries and that's why we're looking at a tipping point." "Only 7 percent of millennials actual agree with the Democratic National Committee's official platform on abortion, which is abortion in all nine months for whatever reason, taxpayer-funded. They are the extremists on abortion, not us," she commented to CP in the March for Life press tent. While it will be nearly impossible to get any meaningful legislation to the president's desk due to the Democrats winning control of the House of Representatives in November, almost all of whom support abortion rights, Sen. Steve Daines, R-Mont., remains hopeful about meaningful government action for the unborn in the upper chamber. "We're going to keep moving forward: solid, conservative judges, pro-life judges," Daines said in a CP interview, highlighting the record speed with which federal circuit court and appellate confirmations have occurred, in addition to the elevation of Neil Gorsuch and Brett Kavanaugh to the Supreme Court. "President Trump is delivering results both in terms of policy and administrative actions in the White House combined with a pro-life Senate," he said, adding that he's bolstered by the higher number of pro-life senators elected in the 2018 election cycle. "As we've seen the developments in ultrasound technologies, the clarity with which we can see those babies now during pregnancy, it's conclusive that we're talking about a human being," he said. "And there's the principle that people believe what they discover for themselves. Young people are discovering for themselves, as they develop their own convictions and beliefs on this issue, that the science and technology and their faith coming together say 'this is life.'" The theme of the 2019 March for Life was "Unique from Day One: Pro-Life is Pro-Science."